Forest Pack 6 beta is now available for testing. Registered users of Forest Pack Pro can download the upgrade from the User Panel->Beta versions. For any question about this release, please use the Forest Pack beta forum. Added support for V-Ray Next final (v4.02.04). Fixed: Display->Render->Mode has no effect in Arnold (always is set as "Automatic"). 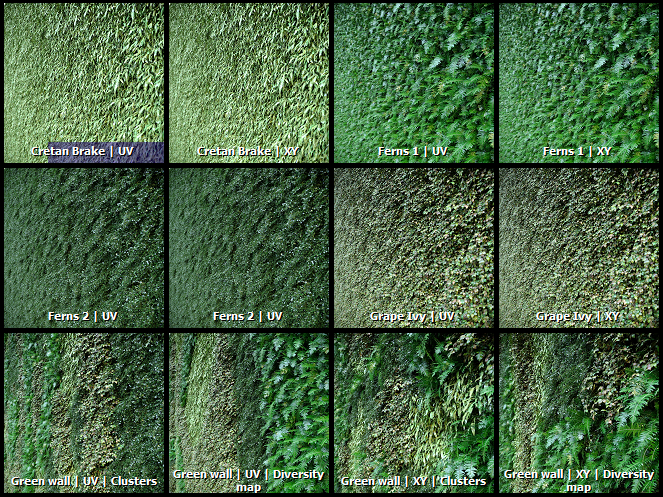 Fixed: Forest Color doesn't work in Arnold if Display->Render Mode is set to "Meshes". Fixed issues with rotated Distribution maps. Fixed animation modes in Arnold. Fixed issues with Custom Edit mode and Effects which modify items position. Added mechanism to search automatically the texture maps, and add them to "Customize->Configure User Paths->External Files". * First time Forest is used, it collects all folders with name "maps" in the Library paths (defined at Library Browser->Options). * These paths are added to the registry at HKEY_CURRENT_USER\Software\Itoo Software\Forest Pack Pro\TexturePaths. * In a second phase, all paths defined in "TexturePaths" are added to External Files (this part works in same way that previous versions). * The process is executed silenty in render nodes, and can be disabled setting "collectTexturePaths = 0" and "checkTexturePaths = 0" in forestpack.ini. Added Areas->"Force Open Splines". When enabled, treats all splines in the Area as open, applying the "Thickness" parameter. Distributions from Particle Flow can be filtered by Event. * 'particleFlowEventID': returns a numeric ID from the Event of a Particle Flow. The ID is generated as the first number found in the Event description. For example: particles generated from 'PF Source 01->Event 02' get ID = 2. * 'particleRotation', 'particleScale': rotation and scale of particle in Particle Flow distributions. Added support for "Physical Material" and Arnold "Standard Surface" in Material Optimizer. * The tool cannot convert to those materials, just can apply Forest Color/Edge and the optimizations. Forest Tools now disables FP objects using Display->Build->"Disable Object", instead setting Custom Objects to "Disabled", as before. This method is more suitable for the Forest Lister. Distribution by Path->"Follow Path" can be defined for X and Z axies. Fixed bug with 'Align' in PFlow distributions: the rotation in degrees was computed as radians. 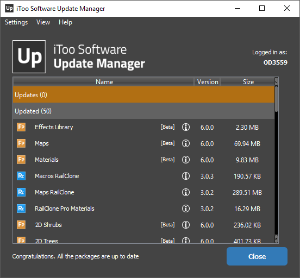 For example: for "HKEY_LOCAL_MACHINE\SOFTWARE\Itoo Software\Forest Pack Pro\MainDir", you must define the variable "ITOO_SOFTWARE_FOREST_PACK_PRO_MAINDIR"
Added support for Arnold 5.1 and MaxToA 2.0, both in Max 2018 and Max 2019. * Forest Color and Forest Edge are supported turning on "Legacy 3ds Max Map support" in Render Settings->System. Added support for V-Ray Next beta 3. * Problems with Max 2013/2014 and V-Ray Next are solved as well. Fixed crashing bug in V-Ray RT when Geometry items have not valid object assigned. This feature is removed: "Faster load of V-Ray and Corona proxies". It was causing several issues in Corona Renderer. Fixed missing User Paths in Library Browser->Options. Added support for 3DS Max 2019. * Forest Color and Edge mode are not currently supported. Both require an update to Arnold, which is expected within the next few months. Fixed: Distribution by Path generates same distribution for each sub-spline. Fixed: Display->Viewport Mode overrides Render Mode on V-Ray IPR. Added support for V-Ray Next beta 2. * Note: actually there is a problem with Max 2013 and 2014 causing a crash on render. We're investigating this issue. Other Max versions work fine. Added "Select all Forest dependences" to the quad menu. * It selects the Forest object together all their dependences (geometries, areas, surfaces, etc). Fixed crash rendering nested FP object without any material assigned. Fixed potential crash with animation maps returning negative values. Fixed freezing issue with nested objects and V-Ray IPR. Fixed bug in Effects expressions with functions returning vectors. Fixed freezing issue with V-Ray RT on IPR mode. Fixed: excluding areas from FP objects are not updated correctly in some renderers. Fixed: some parameters are not updated in the interface when are animated using Autokey. Fixed rare crash when Forest object is created. Fixed freezing bug when a nested FP object is used in more than one Forest. Fixed: "Geometry->Consolidate Materials" is always on, regardless of the checkbox. Fixed problems with Layered Lawns library. Fixed: surfaces are cleared when importing a preset from library. The "XRef Unit's mistmach" popup (shown when loading from library) can be disabled setting disableXRefPopups=1 in forestpack.ini, or from "General->Configuration->Disable Popups". * "General->Configuration->Disable Popups" will disable ALL Forest popus, not only this one. * Before turning off the popup, double check that "Rescale the XRef Objects" is on, as default option. If not, libraries will be not loaded correctly. Initial computing of Point-cloud now is multi-thread. That should improve a bit the load of heavy models. Added support for V-Ray Next beta 1. New memory management system. Scattering performance is increased up to 150% with large distributions. Improved stability with V-Ray IPR. Faster load of V-Ray and Corona proxies. Viewport now uses a quick draft of the proxy, instead the full mesh as before. Note: To use Point-cloud with Corona proxies, it's necessary to set the Proxy Viewport method to "Full Mesh". Visible Rollups. Lets to hide Forest rollups from the Modify panel. Disable Popups (moved from the General rollup). Group Boxes are collapsible. State is global and saved between Max sessions. Resizeable lists (such as Geometry List). State is local to each Forest object and saved with the scene. Added new Icon mode to Creation panel.that lets you to create an empty Forest object, and edit it later from the Modify panel. Added item tooltip to the listboxes. Put cursor over an row to see the full item name. 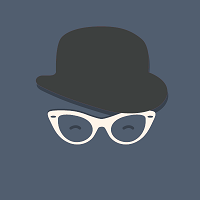 Image, the default mode in previous versions. Using Reference objects, by Pivot point or Mesh faces. NB Reference and Path modes replaces Tree Editor->Creation Tools, which have been removed. 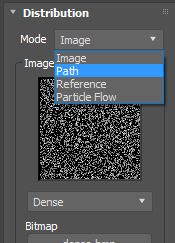 Added attributes for Particle Flow distribution: particleAge, particleSpeed. Added a generic property to the items in Tree Editor: User ID. This value can be edited by the user and read in Forest Effects, for any use. Also it's used for some special purposes. For example, in Distribution->Path mode it stores the item counter along the path. "fpItem.xrotaxis", "fpItem.yrotaxis", "fpItem.zrotaxis": rotation of Forest Item expressed as a system of 3 vectors. New Parameter types: Texture maps and Curves. Multiple effects per Forest object. distPathPos: Normalized position of item on path (Distribution by Path only). distPathTangent: Tangent vector of path on item position (Distribution by Path only). When fpItem.geomID is greater than maximum ID, result is the remainder, not the maximum value as before. 30 Effects added to the library. 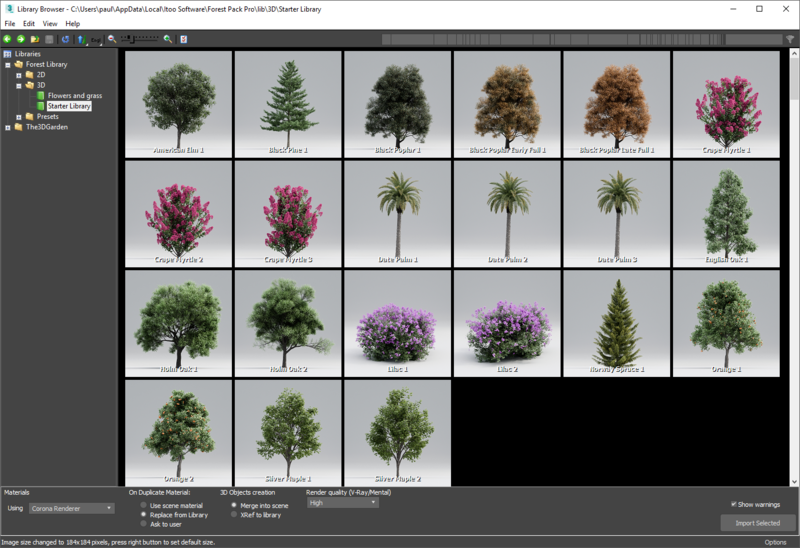 New manager for downloading, installing and managing Forest Pack content including libraries, presets and effects. Separates the library content from the application. Download new libraries, presets and effects at any time. Surface parameters are now imported from Library presets. New starter library - 23 new trees in 11 species. 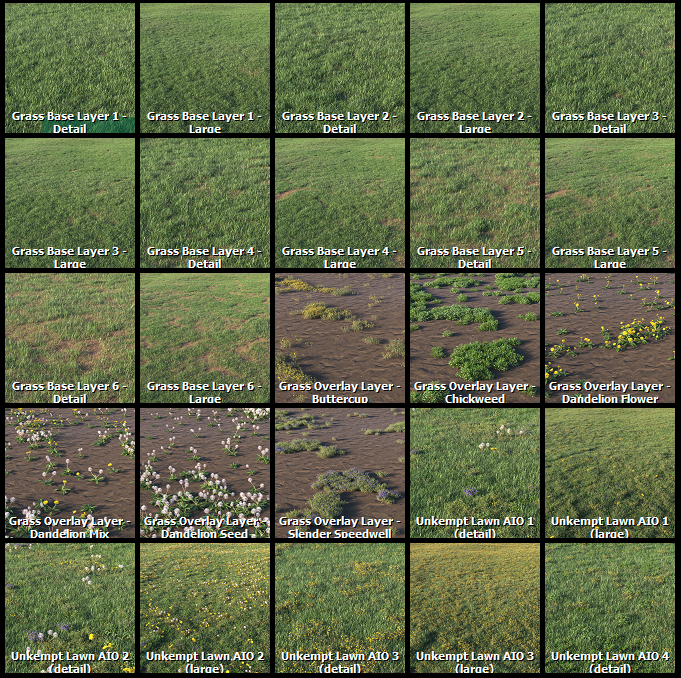 New grass presets designed to work in layers. 26 variations. Improved viewport performance with Camera features. (When camera changes, Forest is updated only is some Camera feature is used). Added Maxscript function: getSelected(). Returns indexes of items selected on Custom Edit mode (array of integers). Material->Forest Shader parameters are removed from the interface. These are used only for billboards in Mental Ray and if needed, you can modify them from Maxscript as: fastopac, tracedepth, opaclevel, selfillum, irradiance. Appended source name to Library objects imported in the "forest_templates" layer (i.e. "_forest_library_H4AXKAQ_birch_01"). "Tree Editor" is renamed to "Items Editor". Replaced other references from "trees" to "items"
Added Display->Point-cloud Style: Small or Large Dot. Value is global to all Max scenes. "Camera->Limit to Visibility" and "Look-at->On" are off by default. Main Forest folder is moved from "C:\Program Files (x86)\Itoo Software\Forest Pack Pro" to "C:\Program Files\Itoo Software\Forest Pack Pro"
32 bit versions and legacy plugins (Forest Pro 2.x) are removed. Fixed: Items are not visible on viewport while using Interactive Render (both V-Ray and Corona). Fixed: "XRef Material->Override" option is ignored when building the Forest automaterial. Fixed: Changes in the Geometry List don't modify existing items in Custom Edit mode. Fixed updating issue with Color Swatch controls in PBStore. Fixed behaviour of Forest Lister when rollups order is changed. Fixed several issues of General->Presets. Now Areas, Surfaces and Effects are not saved with the preset. Fixed: Geometry->Color ID doesn't support Copy/Paste. Fixed crash loading nested library objects. Fixed: Items with high values of random Translation are placed outside of its area. Fixed: Effects Editor cannot load JPG thumbnails. Fixed: Both Point-cloud and mesh are drawn on viewport when Display->Render->Mode is set to "Meshes". Fixed: Tree Editor->Add inserts multiple items for LOD objects. Fixed: User toolbars using Forest actions are reset when Max is loaded. Fixed crash loading scenes with LOD linked to a XRef. Fixed: Camera in Deadline render jobs is not updated, when using "Camera->Auto assign to active view". Fixed issue with missing references when a library item is used both in the main and a XRef scene. Fixed "controller returns invalid type" warning when a Controller Parameter is linked to a rotation control. Fixed: Error reading constant values in expressions with regional settings which not use "." as decimal point. Fixed: Z value of fpItem.areaIncNearest and fpItem.areaExcNearest now matches with item's Z position. Fixed: Parameter->Default range is limited to 0-100 for real and integer types.